Venus Bay is central to the many natural wonders of the South Gippsland area, including Wilsons Promontory National Park, which is only 40 minutes away, as well as Phillip Island and its famous penguins, and much more. 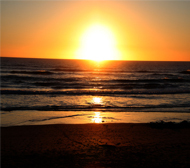 Venus Bay Getaways is nestled on an acre of secluded land, only 300 metres from the wild beauty of the coast. It is hard to believe that a two-hour car trip from the centre of Melbourne can transport you to this haven of peace, tranquillity and indulgence. 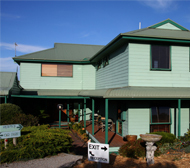 Venus Bay Getaways is a very unusual guesthouse, as it offers 4 star AAA rated hotel-style accommodation, but with the personal touch of hosted accommodation. You can choose from four different suites, each with their own charm. All 4 rooms feature private ensuites and the comfort of reverse cycle air-conditioning, along with a 32” LCD/DVD and complimentary DVD library, beautiful linen on the bed, toiletries and hairdryer and tea and coffee making facilities. It doesn’t stop there, with a stocked mini bar, fluffy robes and slippers also provided. Wireless internet is also available for those who need to stay connected. Of course, the ultimate indulgence is the Day Spa, which offers relaxing treatments such as deep tissue massage, organic facials, manicures and pedicures and more. Day Spa treatments must be booked prior to arrival and are subject to availability, but can you think of a better way to relax and unwind? If you can drag yourself away from Venus Bay Getaways, you will be rewarded with glorious coastal scenery, wonderful opportunities for fishing, surfing and windsurfing, abundant bird life, the beauty of the Point Smythe Nature trail and much more. However Venus Bay Getaways is such a brilliant place to stay, relax and rejuvenate – all without leaving the property, that you just might find it too hard to drag yourself away.